I’ve always been fascinated by the universe and everything in it. I’ve already said how I wanted to be an astronaut when I was little. We recently found a copy of a letter my mum had written to some astronomers’ organisation cancelling my subscription to their magazine, saying that, “although my daughter is very interested in astronomy, your publication is a bit too advanced for an eight year old”. I read A Brief History of Time and watched all the documentaries I could find with Stephen Hawking. I successfully convinced my IB Physics teacher to cover astrophysics as one of the optional subjects (this turned out to be a mistake as I knew more on the subject than she did). I even came close to studying astrophysics at university, but then took a gap year and ended up applying for something totally different. These days, I eagerly consume any programme featuring Brian Cox. And now, travelling in South America, I’ve discovered an amazing field that I never even knew existed: archaeoastronomy. It combines my love of the universe with other interests like history, anthropology, mythology, and physics. At the planetarium in Cusco, Peru (a city which itself is designed to mirror, and point to, specific points in the night sky), they told us about the Incan cosmology and how the river in the sky, our Milky Way, had its earthly counterpart in the Río Urubamba. The Sun, the Moon, and the planet Venus featured prominently in the Incas’ beliefs, and they identified a number of constellations, including the lamas, the shepherd, the fox and the frog, that can be seen in the dark matter of the Milky Way. 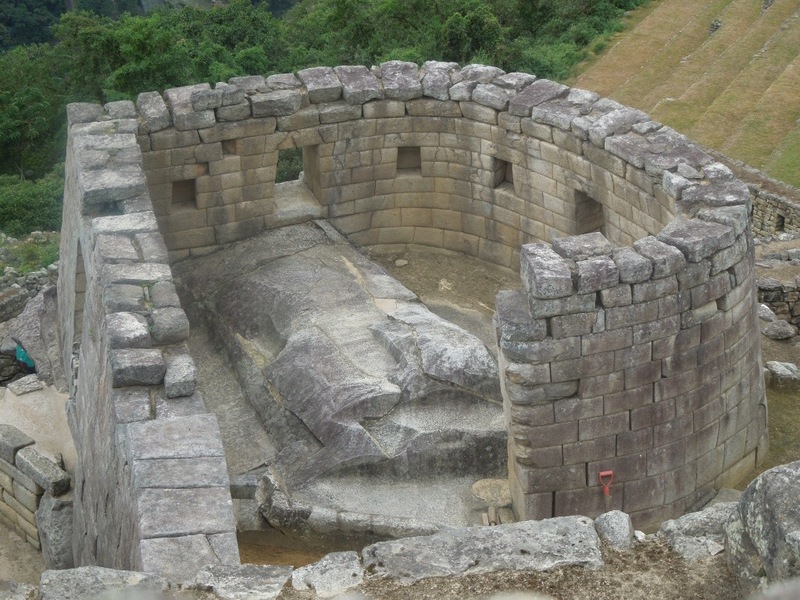 They constructed temples and observatories to align with the rays of the sun during the winter solstice or to maintain a calendar, mostly for agricultural purposes. They used the brightness of the Southern Pleiades to predict the weather and so to plan the harvest (since then corroborated by modern science). 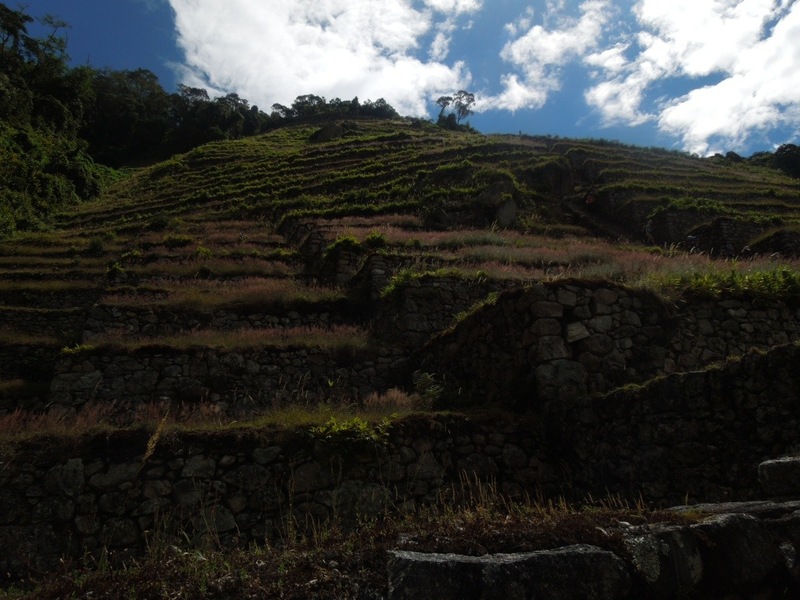 And on the steps of Choquequirao, a line of white stone lamas lead the way to the lama in the sky. Since 1922, we have 88 official, globally recognised, constellations. (Is it just me, or does this number seem very small considering the vastness of the sky? And, I’m sorry to tell you this, but the Big Dipper, the one constellation we can all identify, is not actually a constellation. What?! In fact it’s an asterism, a pattern of stars within a bigger constellation, in this case, Ursa Major.) Of course, they are only constellations from where we are seeing them, in 2D – they don’t actually exist in 3D reality. I’ve had plenty of opportunities to gaze up at the night sky here in South America, in places far from the light pollution that otherwise prevents us from seeing what’s out there – on the boat in the Galapagos, up at Machu Picchu, out on the Bolivian salt flats. Some constellations can be seen, at certain times of the year, in both the northern and the southern hemisphere, while others are unique to one or the other. The most famous constellation in the south, and the smallest of all of them, is the Southern Cross. From this easily recognisable point, I’ve started to learn to identify the patterns that are nearby: the Centaur and the Southern Triangle, as well as some of the Zodiac signs on the ellipsis, the fabulous Scorpio and the not-so-fabulous Libra (it’s my sign, but it’s just four stars in a kind of square shape. Boring!) – still a long way to go to learning all 88! The planets move along this ellipsis, and I’ve been able to see both Venus and Saturn these past months. At the Cusco Planetarium and at the Observatorio Mamalluca in Vicuña, Chile, I got to look through the different telescopes to see things invisible to the naked eye: clusters of stars, including the Jewel Box cluster of coloured gems, located in the Southern Cross constellation and officially named NGC 4755; the binary stars of Alpha Centauri (that look like one star without the aid of a telescope); and the rings of Saturn. Chile is a particularly favourable location for astronomers due to the climate and the clear skies (in some parts of the desert, rainfall has NEVER been recorded. Ah, just you wait for Anna to come and visit), and as such is home to many international telescopes. The European Extremely Large Telescope is currently being built outside of Antofogasta, dwarfing the existing Very Large Telescope. 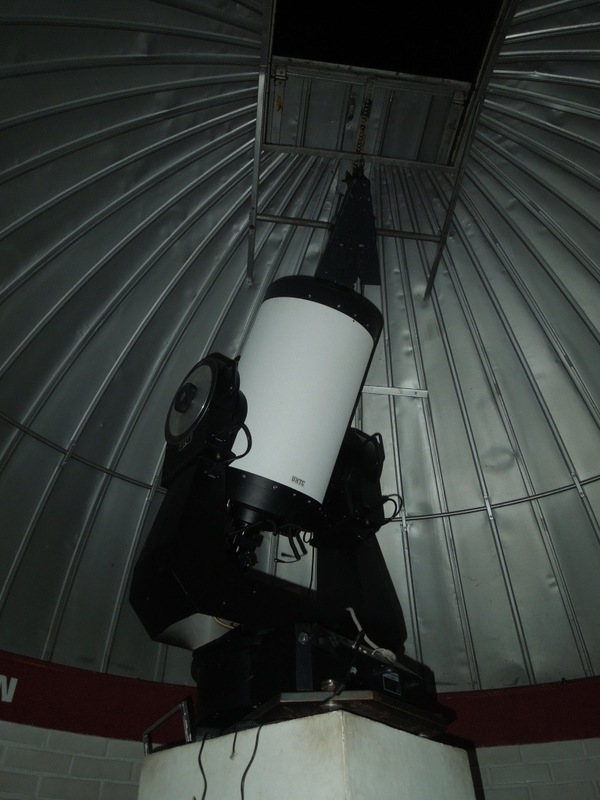 Chilean astronomers (and foreigners who have worked for a year in Chile) are fortunate enough to be allowed free access to these telescopes for a month each year, avoiding the otherwise huge cost of using one of these massiv telescopes to stare at a tiny piece of the sky and most likely find nothing of interest. But perhaps astronomy and astrophysics would not have suited me after all. Really what I want to do is lie in a field and gaze up at the stars, not sit at a desk making measurements and calculations. Looking up at the blackness above – at the billions of stars, each as important as our own sun, whose light has travelled billions of light years to reach us; at the countless worlds that must, with mathematical certainty, exist out there; at the white mass of the Milky Way, which is just one of countless galaxies in the Universe – all of our petty little human concerns pale into insignificance. (Doctor Who, I’m sure, would disagree.) And yet, the next morning, when the sun rises and a blue sky encapsulates our little world – rather like the television studio bubble of The Truman Show – we forget all about that whole Universe that is out there and get on with our daily lives. I guess we have little choice – I’m not sure society would look kindly on me if I suddenly stopped living a normal life and instead wandered the streets pondering the meaning of life. This ain’t Ancient Greece, ya know. But a bit of perspective, a bit of humility, maybe wouldn’t go amiss. 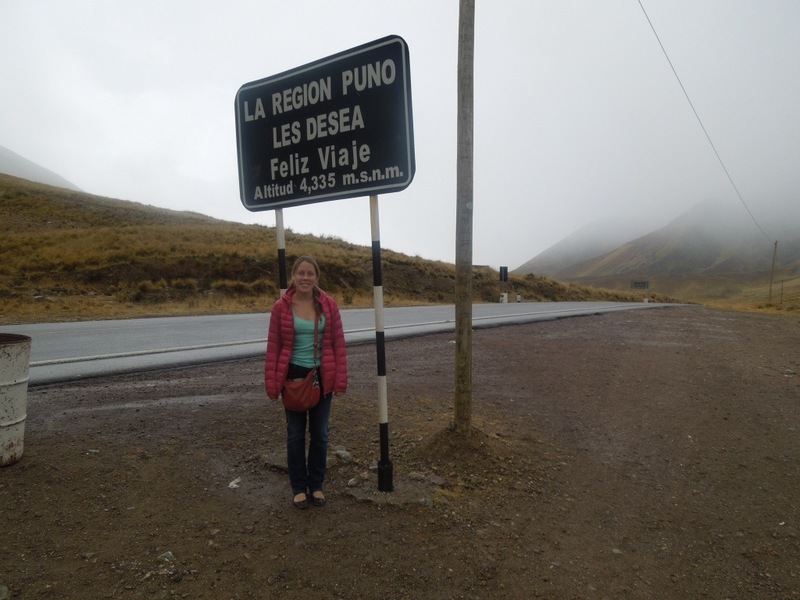 From Cusco, I took the Inka Express bus for tourists, recommended by the Swiss man on my Galapagos cruise and by Lonely Planet. This meant that I wasn’t allowed to sleep on the journey as I would have liked, but instead we were herded off to see some church or ruin every hour or so. The guide was a charming man who looked like the French guy who lures Liam Neeson’s daughter into human trafficking in the movie Taken. “Mi nombre es Hugo. Cómo Hugo Boss. O Hugo Chávez. Jajaja.” He gave the exact same spiel in English as in Spanish. On the way, we saw many of the non-native eucalyptus trees, imported from Australia to stop soil erosion but now planted everywhere as a cheap and profitable crop. Unfortunately in disregard of the fact that these thirsty trees are sucking the soil dry and in a few years time they won’t be biologically or economically feasible anymore. It was snowing at the highest point on the route, and the unfortunate souls who were bravely manning the artisan stalls had to cover them up and, I’m sure, did not do good business that day. 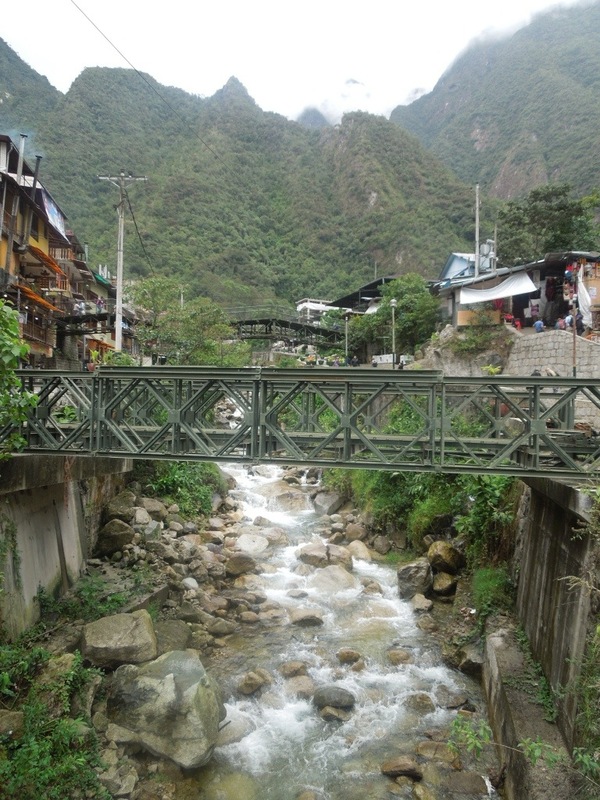 In the communities at this high altitude, we were told, life expectancy is very low. This is due to the climate, their poor diet (they kept livestock but only to sell, while they stick to a very monotonous vegetarian diet), and the use of lama dung as fuel in houses with no windows. Community properties (previously under a feudal system) lack the titles to prove ownership, so the government could take the resources of these areas whenever they want to. The most important promise, therefore, that a politician in this area can make is to award these titles; but the inhabitants have been waiting 30 years for these promises to be fulfilled. Families have 4-6 children, as they need the labour, and education is limited though legally compulsory up to the age of 16. Education, as I’ve been repeatedly told by earnest locals, is the key to economic development and equality. 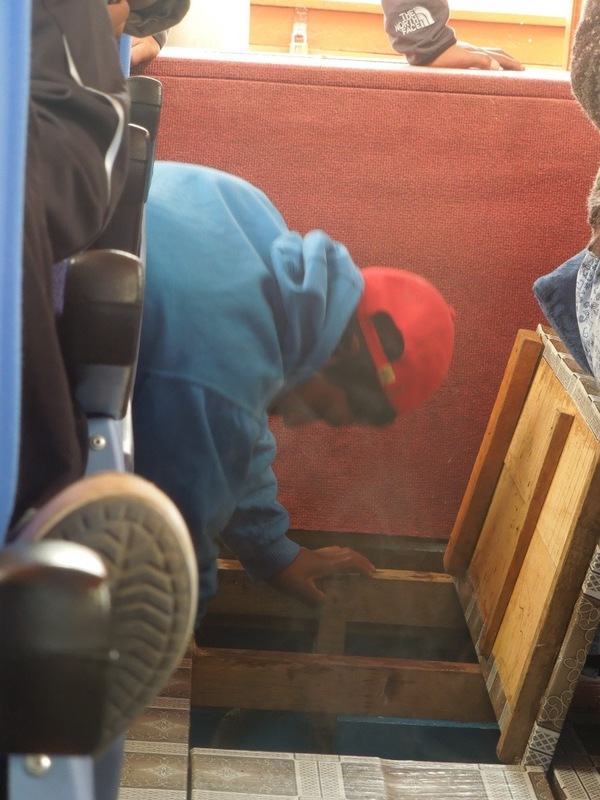 As we approached our destination, we passed through the commercial centre of Juliaca, strategically located between Cusco, Puno, and Arequipa, and close to the Bolivian border, and as such a centre of contraband trade. 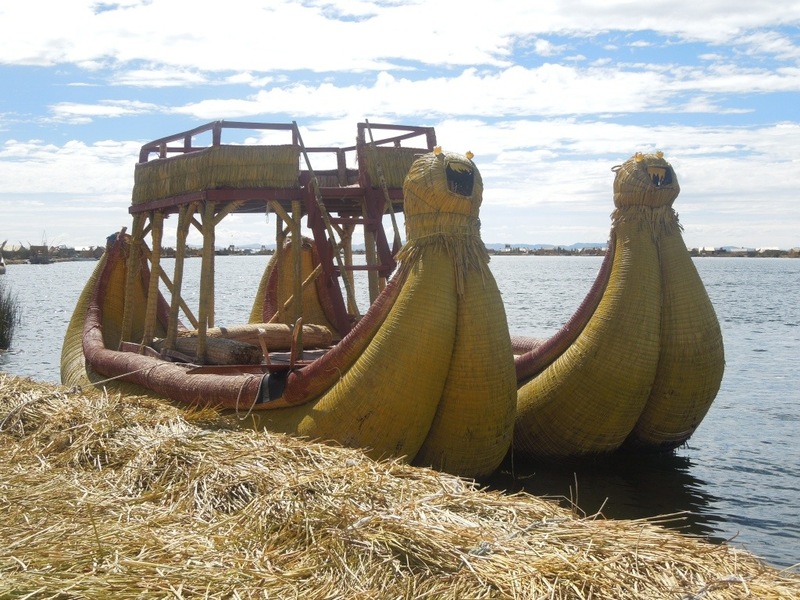 Puno, in fact, wasn’t a whole lot nicer, though more geared towards tourists. 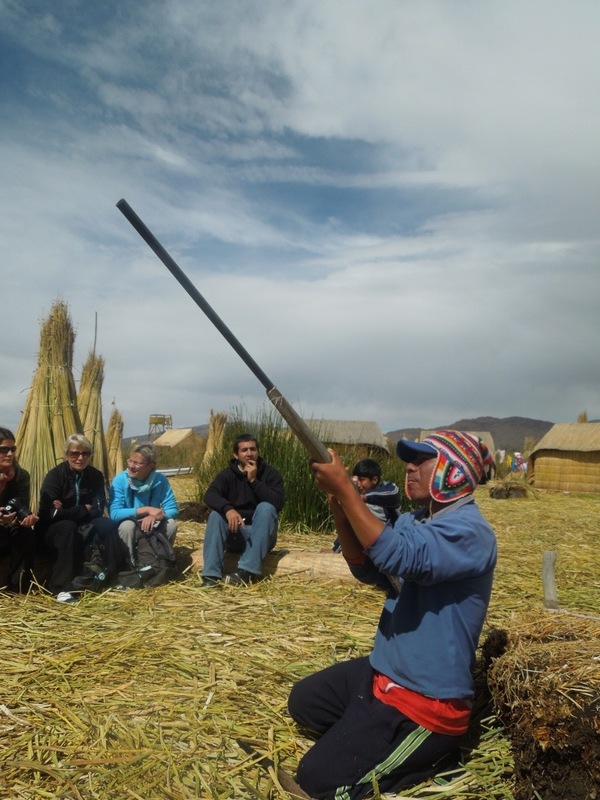 The main attraction is a visit to one of the islands, and in particular the unusual Islas de los Uros. 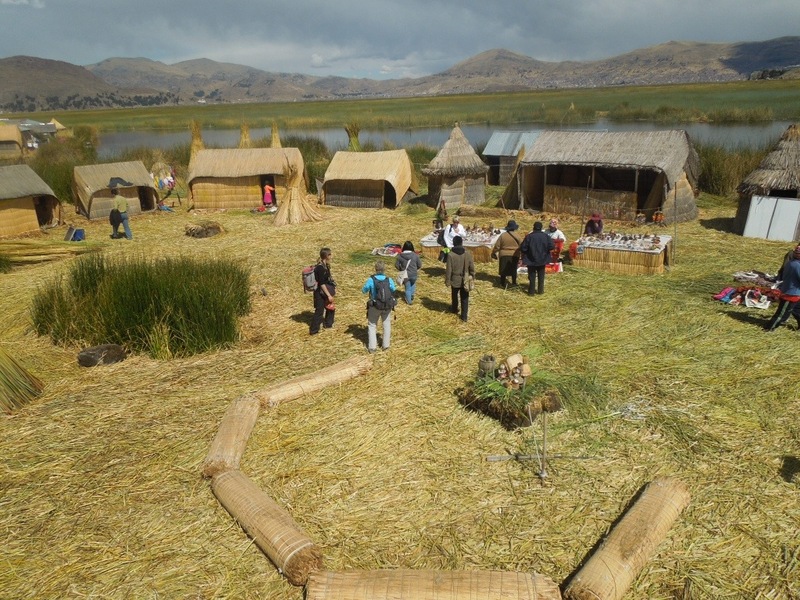 The Uros are a pre-Incan people who live on manmade islands created from totora reed, originally built as a defensive measure against their aggressive neighbours. The boat I took had some rather serious engineering problems but eventually we arrived at the island of Chumi. Five families make this island their home, with a president to lead them. In total, there are 2,000 Aymara-speaking inhabitants on 80 different islands. There is a small hospital and there are three primary schools, but for secondary education the children must travel to the mainland. On the capital island, there are even hotels. “No hay discoteca. No hay internet.” The principal activity is fishing; on the mainland, 1kg of fish can be exchanged for 2kg of potatoes. The people here also hunt birds and eat the meat – better than chicken, apparently. For entertainment, they play football and volleyball – but not basketball. And their weddings last for two days, with people coming all the way from Cusco and Arequipa to get married here. From the small island of Chumi, we were told that we could also make a special visit to the capital island, for an additional, but apparently not optional, cost. As we left Chumi in one of the traditional boats (less traditionally powered by a small boat behind us with an engine), three women said their goodbyes. They sang a local song, followed by Row, row, row your boat, and finally Vamos a la playa. No commercialism here. We had a lovely boat ride after which we were dumped on a small patch of totora reed with an artisan shop, a restaurant, and a toilet. This must have been the ghetto of the capital. 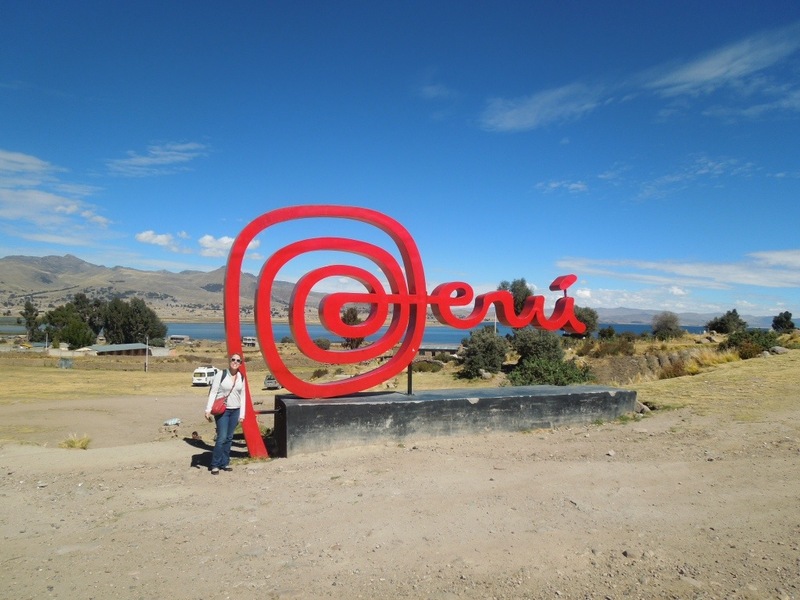 We all stood around there for an hour until the captain decided we would be allowed back to Puno. 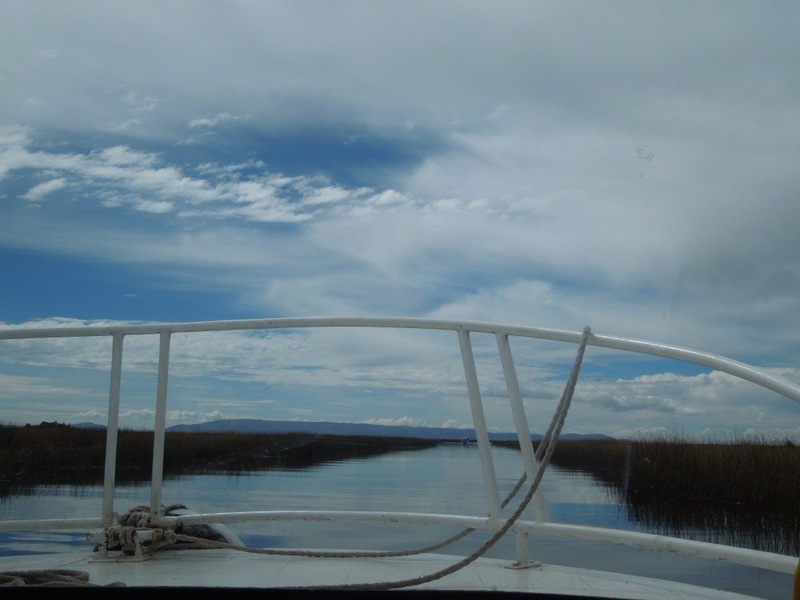 The next day, I left Peru for the Bolivian side of Lake Titicaca. Should the engine be smoking like that? “Bang! Bang! This is how we shoot the tourists.” Haha. Ha! As if I could hope to cover such a topic in one short post, and having just visited a few cities in a few countries. But what I can do is share my experiences of religion on my trip to date. 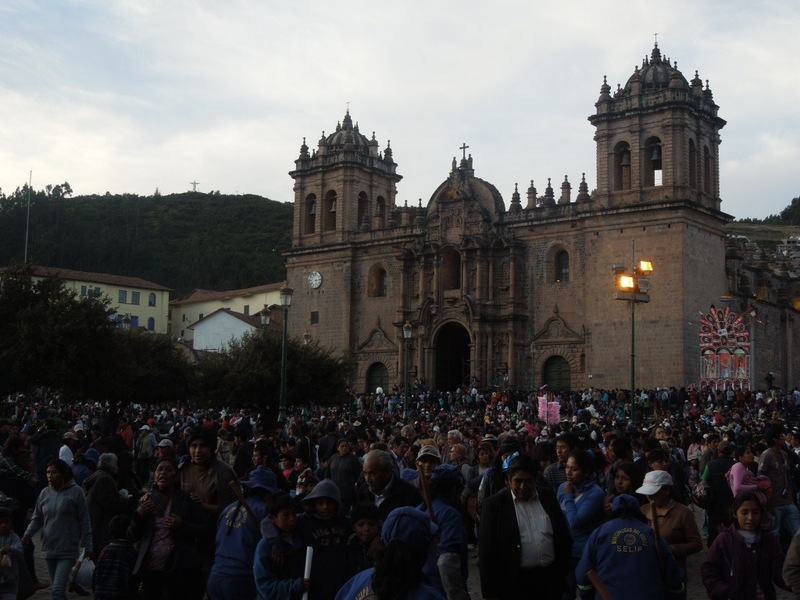 On arriving in Cusco for the Inca Trail, I was lucky enough for my visit to coincide with the start of the Corpus Christi festival. 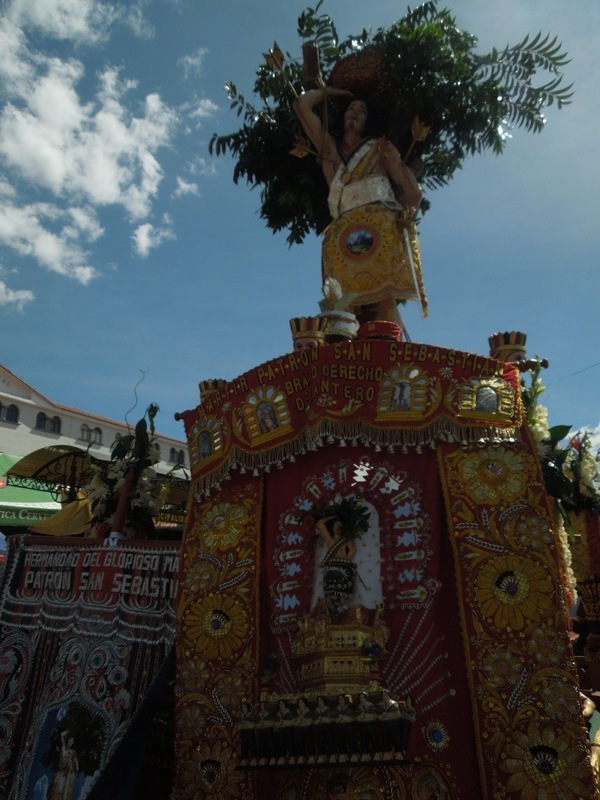 The saints of each of the parishes were taken to the Cathedral, from where they were paraded through town, and returned to their homes a week later. The saints were displayed in all their glory: one wore a beautiful pink and silver dress and carried a parasol and a bird; another was riding a horse; yet another looked like Michael Jackson. (There is, of course, a Santa Ana, and I’m pretty sure I read somewhere that she is the patron saint of corn beer…) The Plaza de Armas was filled with people, there were food stalls with pile after pile of cuy (guinea pig), and brass bands were playing everywhere I went. Corpus Christi, like the Catholic religion as a whole, was imposed by the Spanish over Incan traditions. The Incas used to carry their mummies around the main square, to honour their ancestors; the Spaniards simply superimposed images of their saints and virgins. The Virgin Mary, for example, is said to represent Mother Earth, or Pachamama. Santiago, or Saint James, is Illapa, god of lightning and thunder. To achieve this change in belief system, the Spaniards had to educate the local people on their new religion. 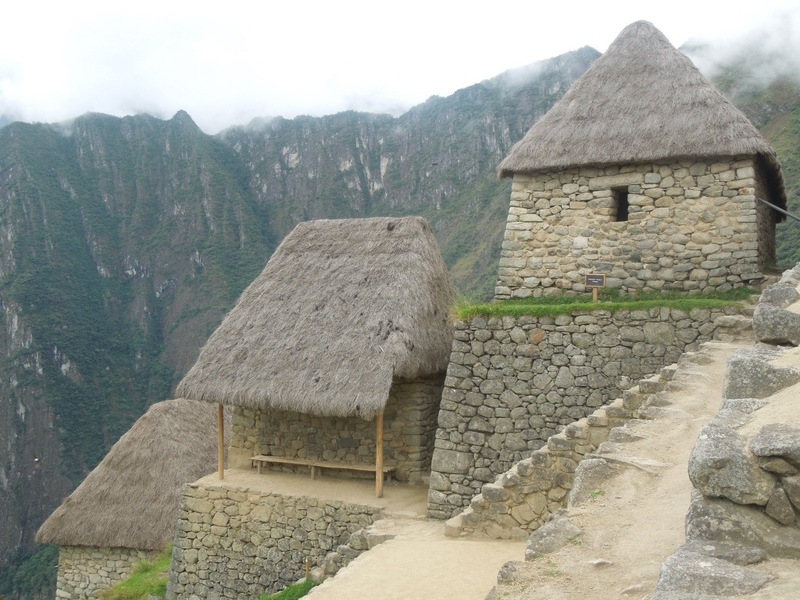 As the Incas had no written language, this education was often done via images. 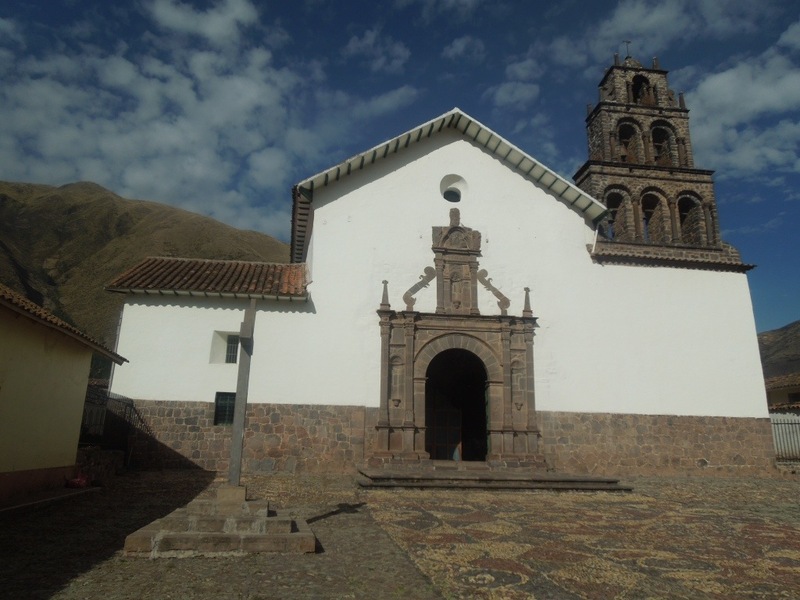 The Iglesia de San Pedro, en route from Cusco to Puno, is built on Inca foundations, with original murals from the Jesuits and paintings with ornate gold frames as well as Moorish ceiling art added by the Dominicans. Two murals at the back of the church convey the nature of hell, on the left, and heaven, on the right, a departure from the Incan cosmology of three worlds. 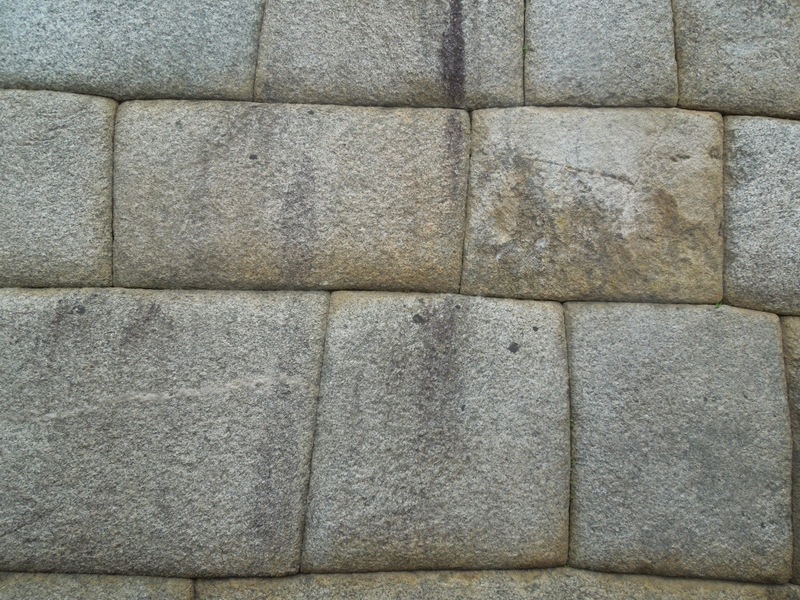 The murals being painted by indigenous artists, hell is not underground – the earth world was sacred to the Incas – but instead is depicted off to the side. An old white man is crossing the bridge to heaven, but on his back is a rope that is being pulled by the devil, representing temptation. The doorway holds text in Latin, Spanish, Quechua (phonetically written down by the Spaniards), and Aymara, the language spoken in the Altiplano region of Bolivia and around Lake Titicaca. Even more divergent is the mural depicting judgement day and hell in the Iglesia de San Juan Bautista, a few minutes away: here, you may be a little surprised when you find that a pope is among the eternally damned. Elsewhere, other incongruities can be found as a result of this syncretism. The painting of the last supper in the Cathedral in Cusco includes a plate of cuy, the local corn, and the Andean drink chicha morada on the dinner table, along with a viscacha (wild chinchilla) instead of the more usual lamb. You may also be surprised to find a black Jesus (though his colour is not due to some great statement but simply having darkened with time), El Señor de los Tremblores, credited with the ending of a great earthquake in 1650. (Interesting fact: many churches collapsed in successive earthquakes in 1650, 1950, and 2007, while the Inca-built constructions survived.) 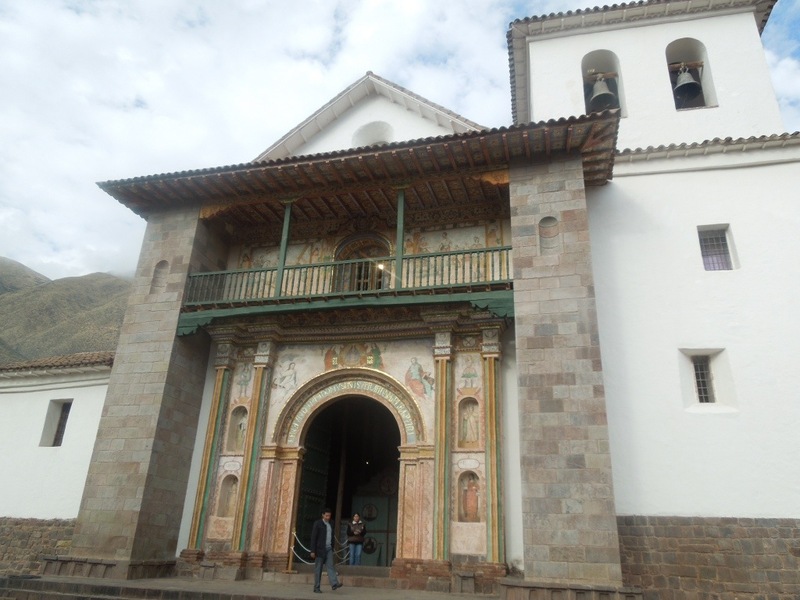 In the Museo de San Francisco in La Paz, Bolivia, you will find the Virgin Mary and baby Jesus wearing the feather crowns of Andean royalty, and paintings depicting the passion of the Christ in which it is the Spaniards, not the Romans, who are whipping and crucifying Jesus. The whole nature of Catholic churches, the world over but even more so in South America, is quite foreign to me, having grown up with the Lutheran churches of poor Sweden, where we had only wood, sometimes painted to look like marble, as well as the still relatively simple Anglican churches in the UK. The churches I’ve visited in Ecuador, Peru, Bolivia, Chile are in contrast incredibly ornate, with gold and silver, mirrors to reflect the sunlight and conjure illumination, and all those patron saints and virgins. In San Francisco, La Paz, I happened upon the end of a special mass, and was intrigued to see people filing out with statues, paintings, and glass cases in their arms, having had these objects blessed. In Copacabana, the priests throw holy water on the bonnets and engines of people’s cars. Although foreign to me, and providing no specific religious benefit or solace, I still appreciate the peace and serenity you find in an (empty) church. I like to go inside and light a candle for my grandparents and for my cousin, to show that I’m thinking of them. But sadly many churches now have electric candles, which completely lack the spirituality of a real flame. And local traditions remain. Witches’ markets sell lama foetuses to bury under house foundations in honour of Pachamama. When drinking corn beer, the first drop is always poured onto the ground in her honour as well. 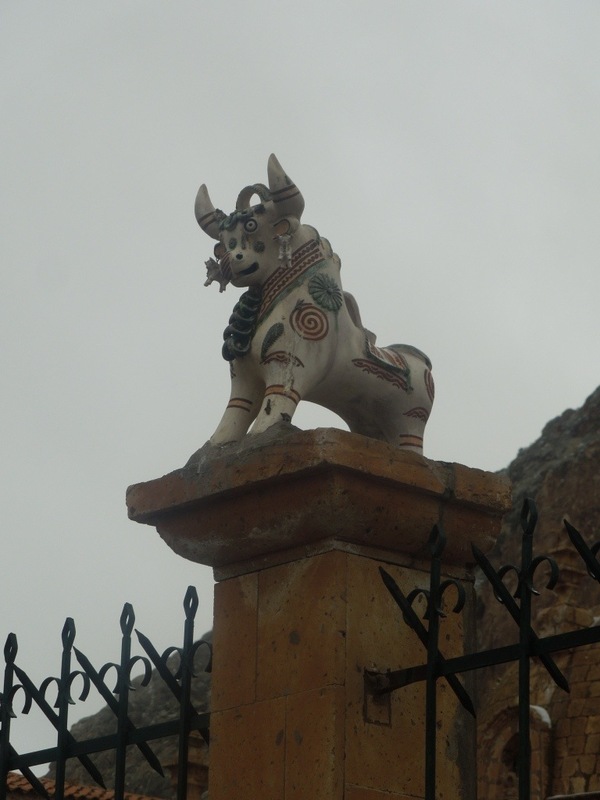 In the Aymara region, small clay bulls are placed as the final touch in a new house to bring the family luck and protection. And in the bull-fighting ring, a condor is tied to the bull to symbolise the fight against the Spanish. While we’re on the subject, the conquistadors of course did not conquer the continent with only their faith. When Pizarro came to Peru in 1532, the Inca empire was still young, less than 100 years old, and had been weakened by a civil war between two brothers after the death of their Inca king father. The victor, Atahualpa, was easily captured and his unarmed guards killed in their thousands. He bargained for his freedom and offered a huge ransom of gold and silver, which Pizarro gratefully accepted, after which he killed Atahualpa anyway. 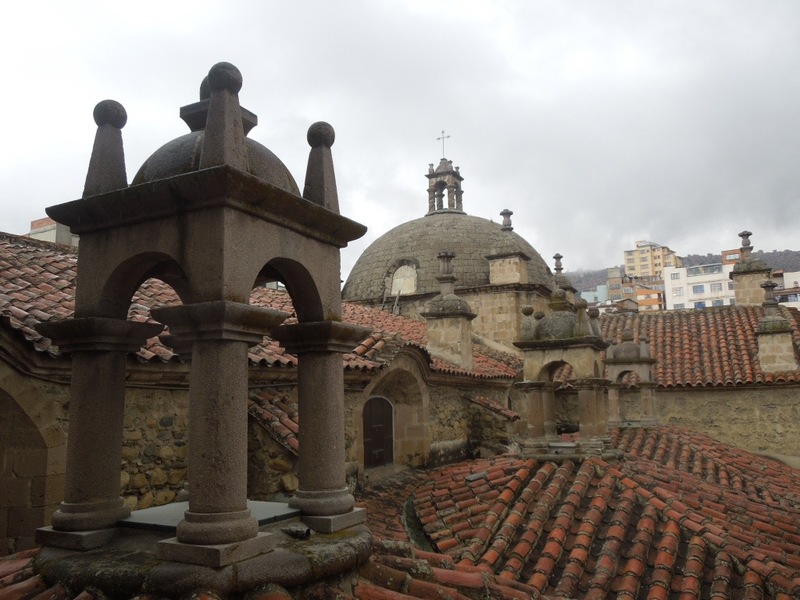 The Iglesia de San Juan Bautista – looks simple from the outside! 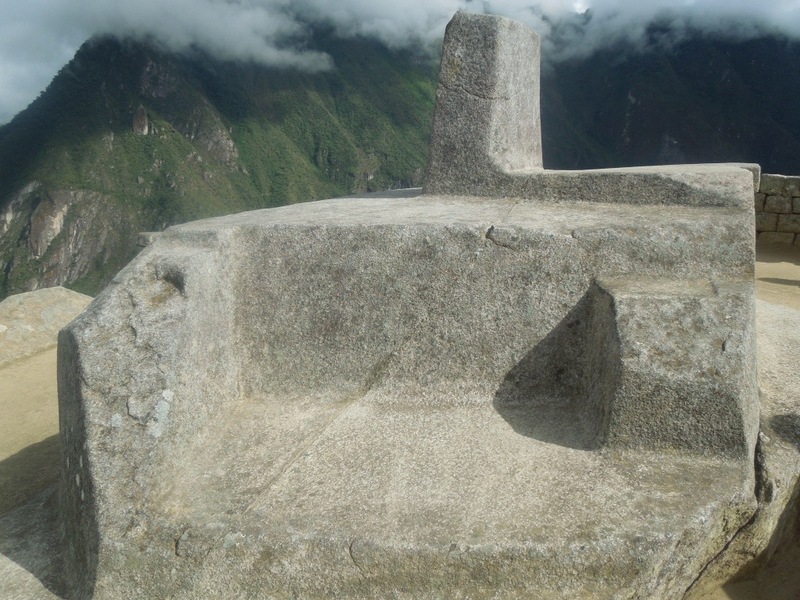 First of all, as I’ve been told now both in Peru and in Bolivia, there is more than one Inca trail – the Inca road system consisted of about 40,000km across the empire. 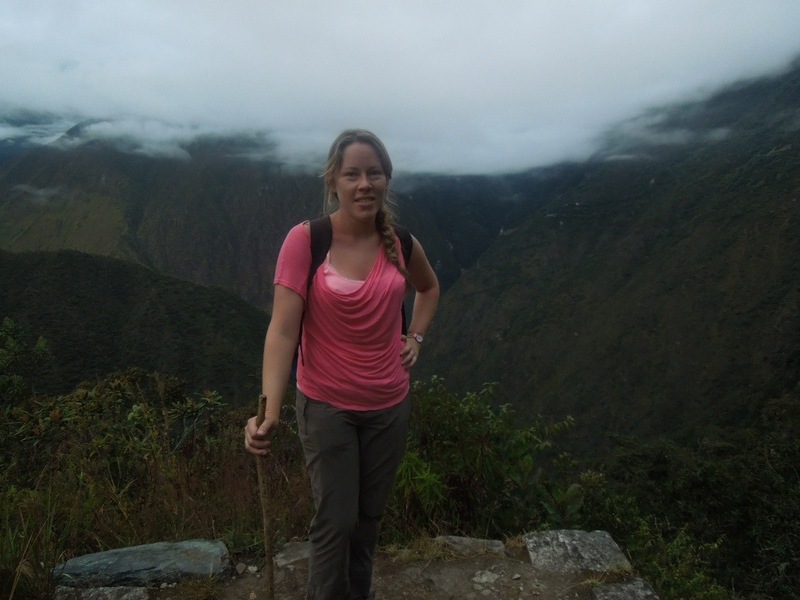 But the famous one to which tourists flock is the Inca Trail, capital I, capital T, the Camino Inca, a four day/three night pilgrimage to Machu Picchu. This is what I had signed up for, the classic route. The night before leaving, I had nightmares and then couldn’t get back to sleep after 2.30am, anxious and excited about the days ahead. 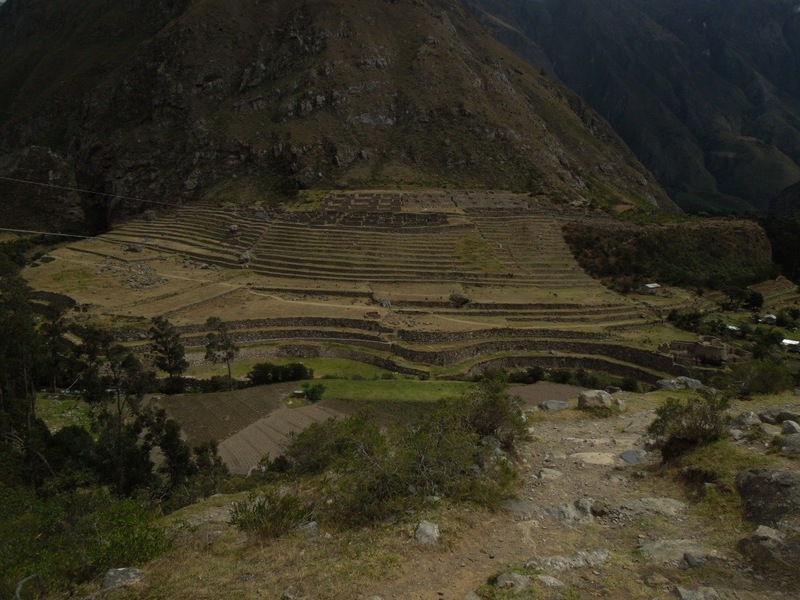 The pick-up was at 5am, with a 1.5 hour drive to Ollantaytambo, a small town at 2,800m that retains its Inca structure, with a huge fortress above. At breakfast, I bought a poncho for 25 soles – it didn’t rain the whole time, so it was a worthwhile investment, I think. We passed adobe houses (they still use the same construction techniques as hundreds of years ago) that had been destroyed in flooding this past February. We also saw a truckload of children being shipped off back home for the weekend – coming from remote villages, they had to travel there for school from the age of eight. 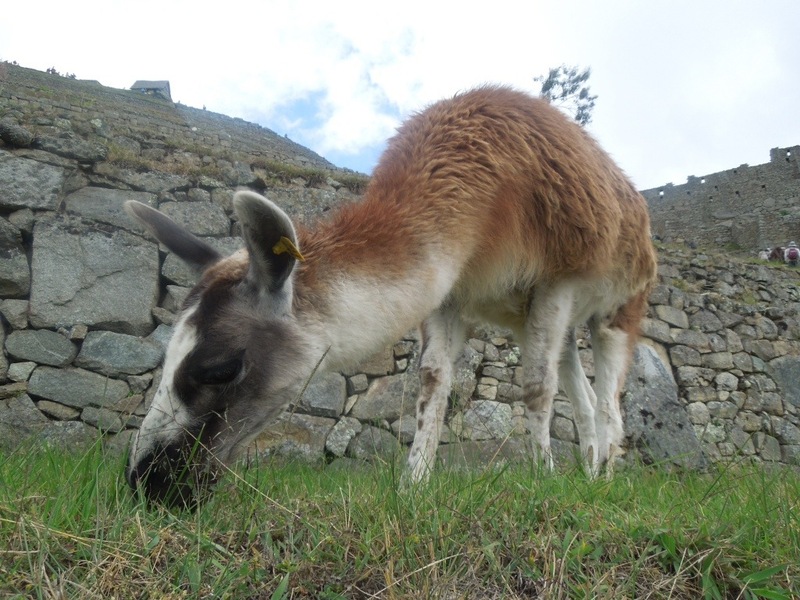 From Ollantaytambo, we continued on to Km 82, from where we would start our trek. The 13 other people in my group were super friendly from the start, supportive when someone struggled because of the altitude, and rarely complaining. Our group, though, was bigger than this 14: we had the main English-speaking guide, Ramiro, plus a second Spanish-speaking guide, Hilton; and then we had the porters. 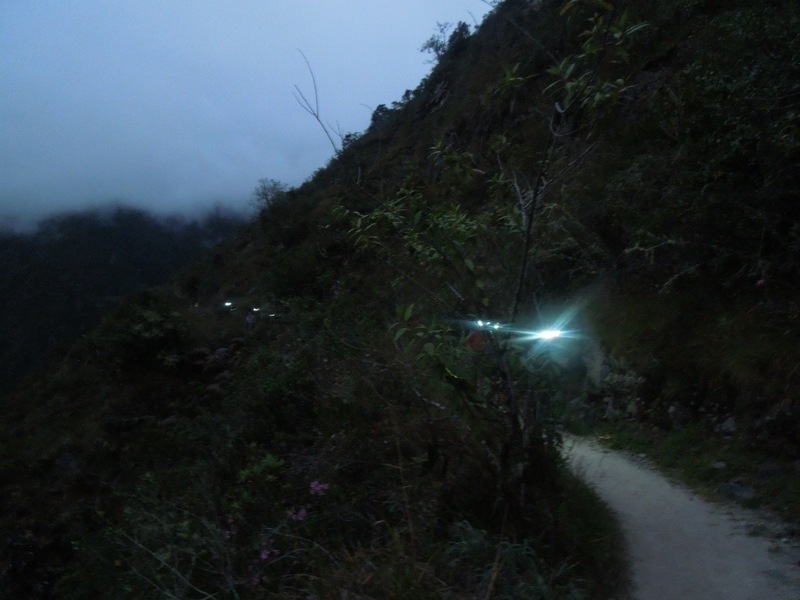 Porters make up more than half of the 500 people who embark on the Inca Trail every day. These are indigenous men, coming from the surrounding highlands and with no more than a primary school education, and this is one of the few jobs for which they are qualified. Their role is to carry our gear – most tourists just carry a small daypack with water, snacks, camera, etc, leaving the sleeping bag, sleeping mat, and extra clothes to the porters – along with the tents, tables and stools, food, and cooking equipment. Just a few years back, there were no regulations, and there would be just four or five porters for a group of our size, carrying as much as 50kg each. Today, the personal things that we give them must not weigh more than 5kg, while the total weight the porters carry may not exceed 25kg; we had 13 porters, including the chef who both cooked and carried. These small men will run past you on the trail with their ‘backpacks’ – more like huge sacks, towering above them. “Porter, porter!” – you’ll hear the warning and you’re advised to back up against the mountain, rather than risk being pushed off the cliff. There was one 21 year old for whom this was his first tour group. At the other extreme, there was a man of 47 who had been working on the trail for 20 years. The oldest were Victor and Victor Raul, at 52. 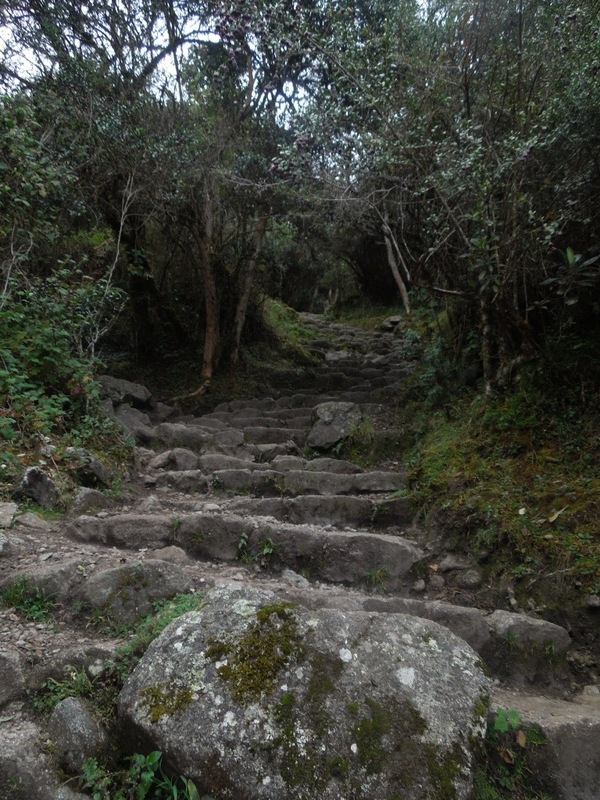 Day two, we’d been told, was the hardest: eight hours of trekking, including a climb of 1,200m in altitude, which was done mostly by the stone steps of the Incas. I thought they were short?! 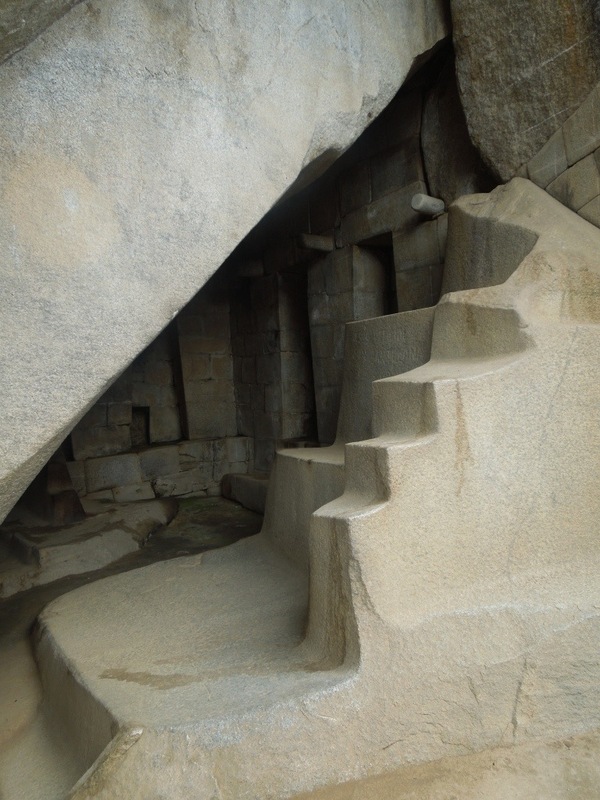 These steps were sometimes half a metre in height, and always continued for longer than you thought (or hoped). The worst part is that you don’t just go up, you go down as well – what a waste of energy! Why don’t they have zip lines to fly across the valleys to avoid this kind of inefficiency? And walking down is actually very hard on your knees. Thankfully, one of the girls in my group found me the perfect branch for a walking stick, which did wonders. I felt like Gandalf roaming Middle Earth with his staff. 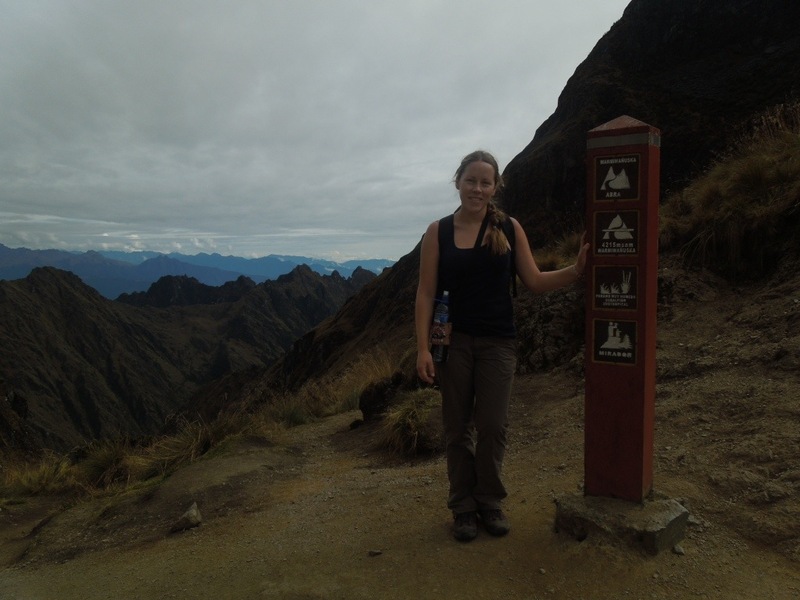 We reached Warmiwañusca, Dead Woman’s Pass, at 4,215m, after which we descended into the valley to eat lunch. No rest for the wicked, though, as we continued on to the egg-shaped Runkuraqay and the ‘inaccessible town’ of Sayaqmarka, after which we finally reached our resting place for the night. 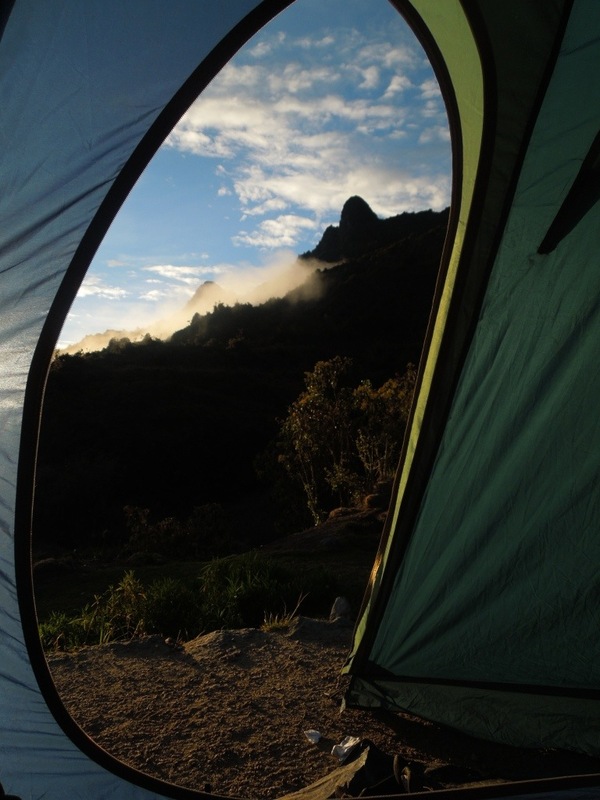 This second camp site gave us spectacular views of the sun setting and rising over the mountains. Day three started with another tough ascent but spectacular views over the mountains, including the sacred Inca peak of Salkantay. 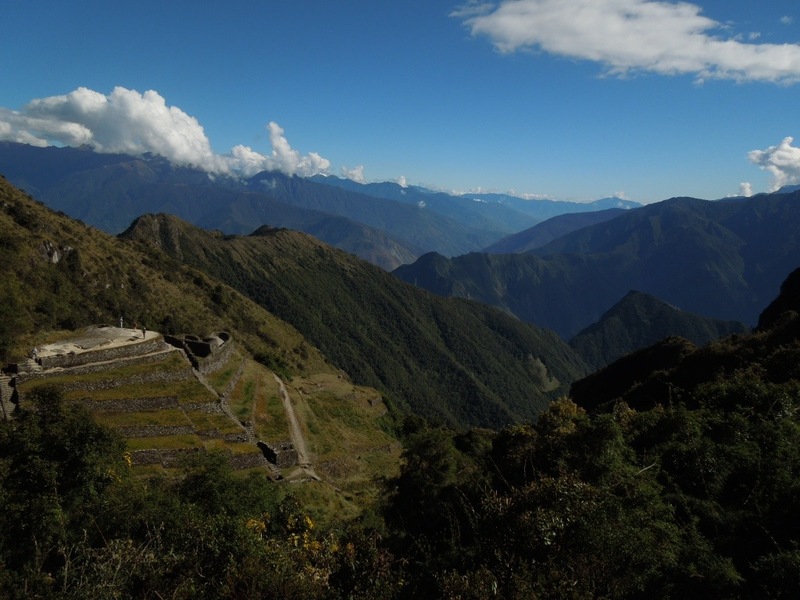 This was an ‘easy’ day, visiting the Phuyupatamarka ruins and the Intipata agricultural terraces, and arriving at the camp site at 1pm. 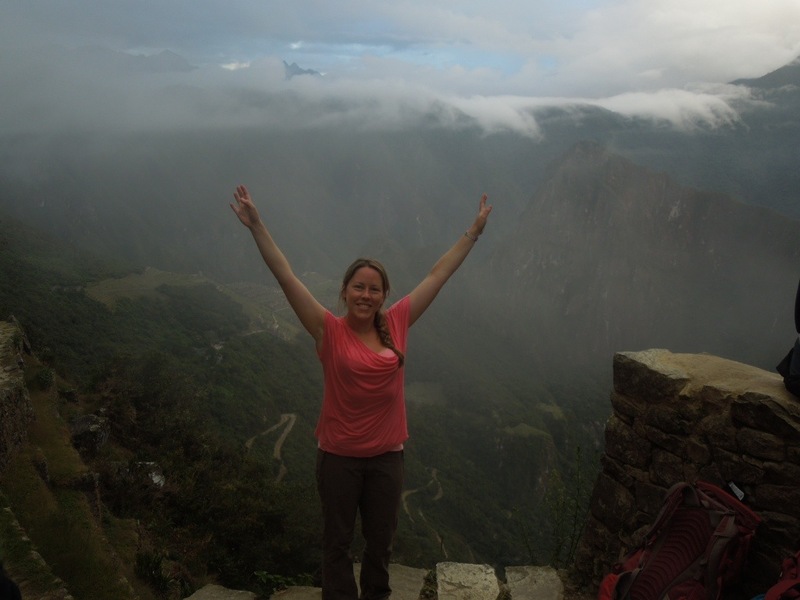 I chose to brave the cold – ice cold – shower so as to be nice and fresh for Machu Picchu the next day. From outside the cabins, you could hear the squeals, both male and female: eeeee! oooo! wow! brrrr! (Lonely Planet says there are hot meals and massages here but not anymore! The government shut it down.) 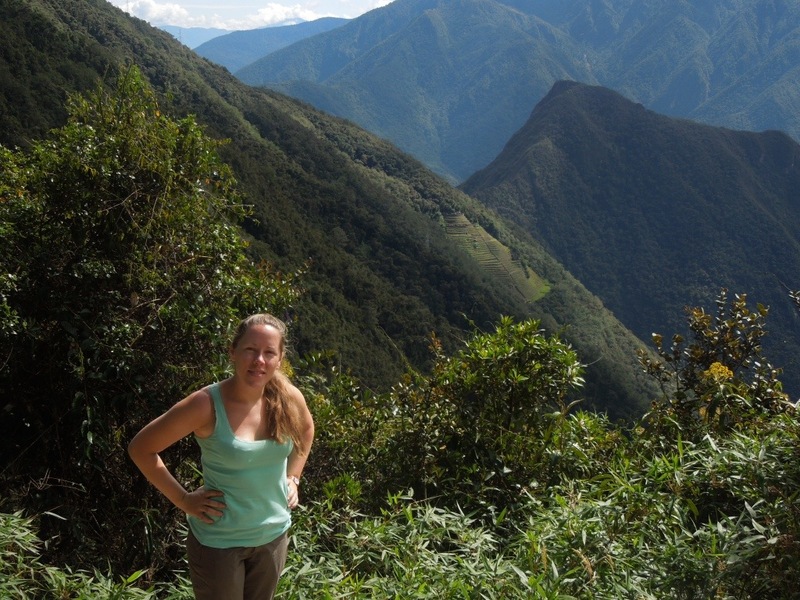 There was an afternoon visit to the Wiñay Wayna ruins but I stayed in my tent as I was coming down with a cold and wanted to be healthy for the big finish the following day. I’ve since been told that these ruins were the highlight of the trek. Ho hum. After dinner (which included a cake with the words “Mañana, llegamos a Machu Picchu” – tomorrow, we arrive at Machu Picchu – my second cake with inspirational icing on this trip), we had a ceremony to thank and tip the porters, and then it was off to bed, in preparation for the 3.30am start the next day to get to the Machu Picchu check point when they opened at 5.30am. 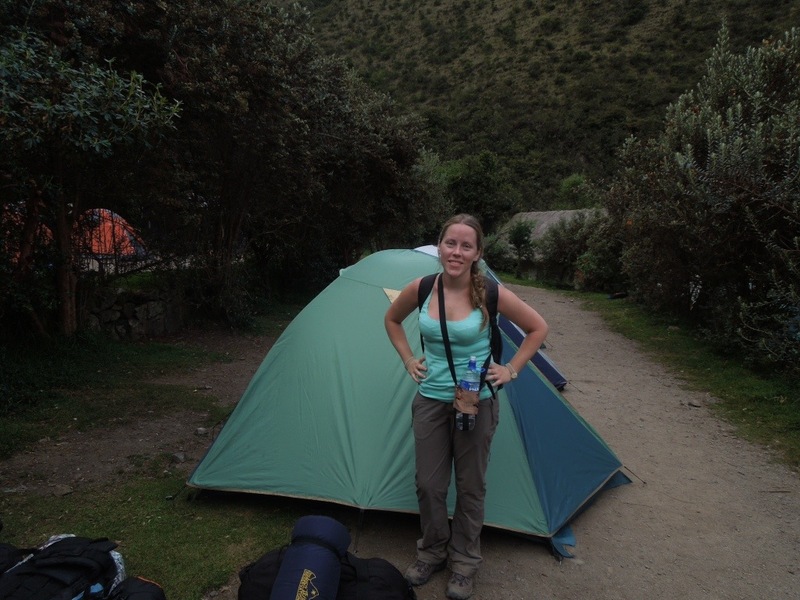 I actually slept quite well – the tents were great, and the sleeping bags sufficiently warm, while my down jacket made a perfectly adequate pillow; the main problem was the hardness of the ground, which bruised my hips and led to having to turn over endlessly to alternate the side that felt the pain. And I ate very well, the meals were way beyond my expectations. 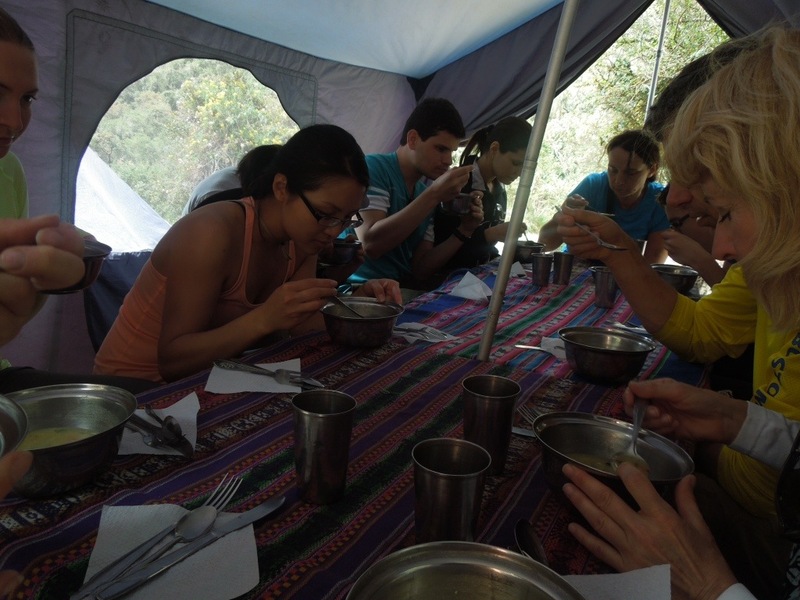 In the morning, we had a wake-up call with coca tea, followed by four, yes four, sit-down meals. Breakfast was bread with jam, hot drinks, plus omelette or pancakes; lunch was a two-course meal with soup as a starter and a hearty main dish (plus yummy garlic bread on the first day); happy hour was not what we would expect at home but it was pretty happy nonetheless, with trays full of popcorn and wontons drizzled with caramel; and dinner was a three-course affair with meat plus a choice of three carbohydrates for the main, followed by dessert and hot drinks. We could also buy snacks and drinks at various little stalls along the way, the cost increasing exponentially with the distance from civilisation and the time and effort needed to carry the items up the mountain. 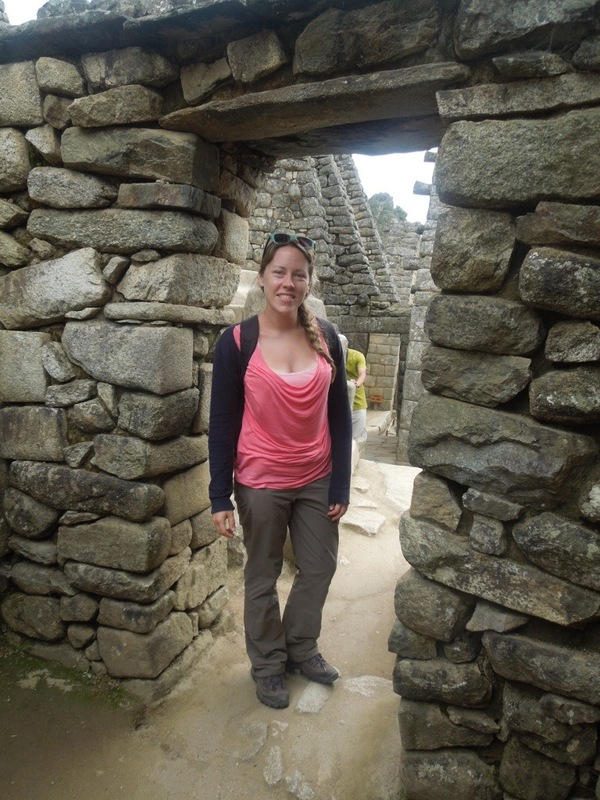 The toilets, by the way, started as toilets (1 sol and you get toilet paper and running water), became posh ceramic holes in the ground, then just holes in the ground, and finally returned to actual toilets when we reached the tourist hub of Machu Picchu. 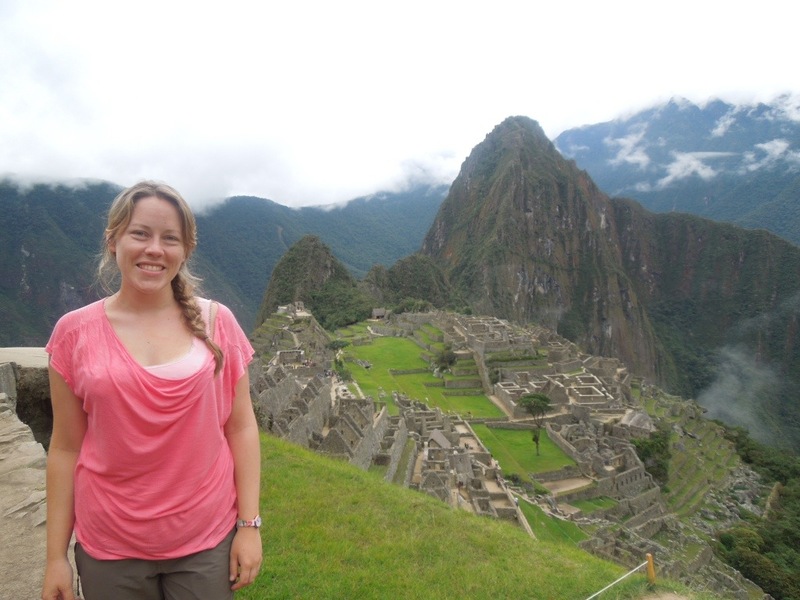 I had been so focused on seeing Machu Picchu itself, that I had completely missed the fact that I would have three fantastic days of experiencing nature, exploring several other ruins, getting to know 13 lovely people, and pushing myself physically with the satisfying feeling of achievement that followed. I understand that some people don’t have time to do the trek, while others are physically unable to do so. 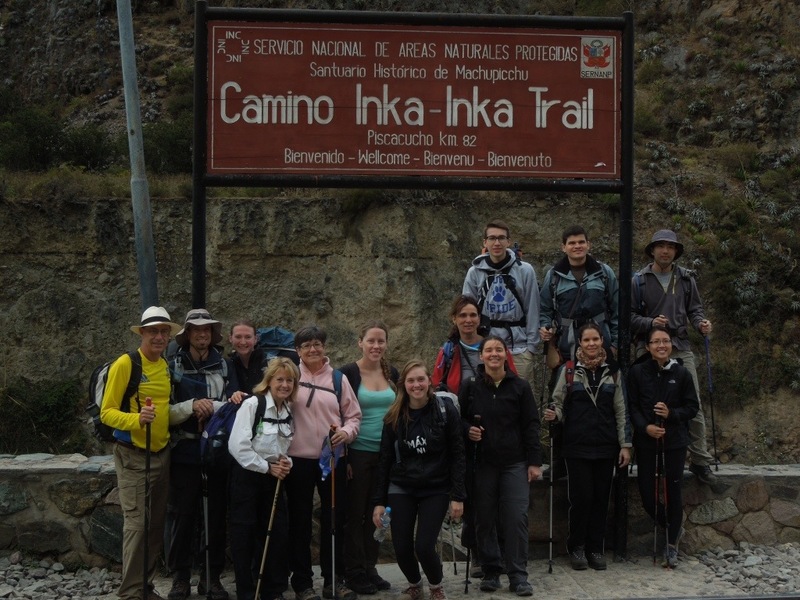 But for the rest of you, I strongly encourage you to invest your time and money to experience the full wonder of this Inca pilgrimage, rather than just taking the train up to tick another box. 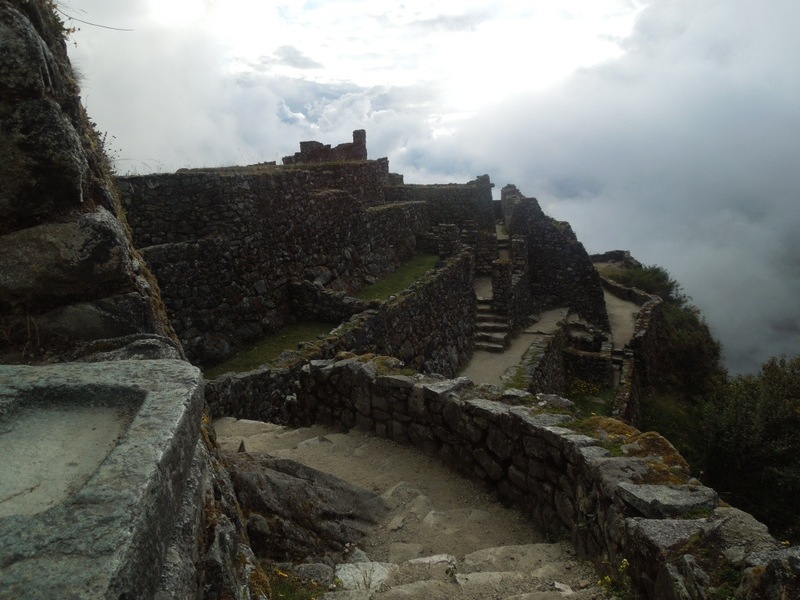 -I went with Inca Trail Reservations – well organised, good food (with a vegetarian option), and a friendly, English-speaking guide. Another company that comes highly recommended from a friend is Explorandes. The agency provides a sleeping mat, and you can rent a sleeping bag if you don’t have your own (- I also recommend a silk/cotton sleeping bag liner to stay clean and warm! ).